Shazam! is a difficult movie to dislike. It’s the most consistently entertaining entry in Warner Bros and DC Comics superhero universe to date even if it isn’t as inventively insane as James Wan’s Aquaman turned out to be or if it doesn’t feature as many emotionally euphoric highs and intense sequences of action heroics as Patty Jenkins’ Wonder Woman offered up. Director David F. Sandberg’s (Lights Out, Annabelle: Creation) bubbly effervescent blend of kid-friendly comical antics and adult-centered moralistic conundrums is a solidly ebullient rollercoaster ride of comic book pyrotechnics that’s a heck of a lot of fun. I had a grand time watching it. Something tells me the majority of general audience members are going to end up feeling the same. 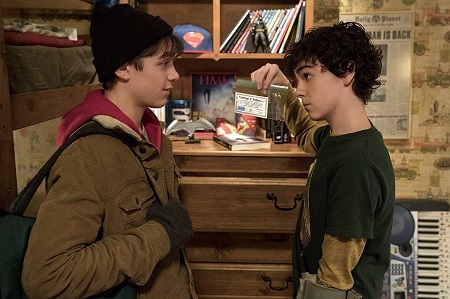 Philadelphia orphan Billy Batson (Asher Angel) has been searching for his missing mother for the better part of the last couple of years, running away from a variety of foster parents in his quest to learn what has happened to her. 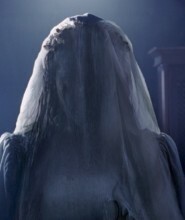 After his last escapade the 14-year-old has been dropped into a group home run by Rosa (Marta Milans) and Victor Vasquez (Cooper Andrews), quickly making the acquaintance of his five fellow bunkmates Freddie (Jack Dylan Grazer), Mary (Grace Fulton), Darla (Faithe Herman), Eugene (Ian Chen) and Pedro (Jovan Armand). While everyone seems nice and the atmosphere is positive, Billy is still making plans to run away, only going through the motions of trying to fit in with the rest of this seemingly happy group until the right moment to bolt arises. But things quickly change. After stopping a pair of bullies from beating up Freddie, Billy is magically transported to a surreal castle where he meets a grey-bearded old man with a giant staff proclaiming to be a wizard (Djimon Hounsou). He has been searching for a champion, someone pure of heart and spirit he can pass off his power to, and he’s chosen this young teenage boy to be that person. 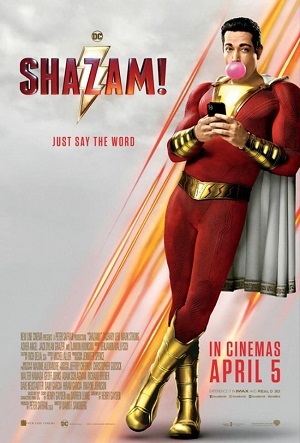 All Billy has to do is say the man’s name and he’s instantly transformed into the dynamic Shazam (Zachary Levi), and once back in Philadelphia he’ll have to decide whether or not he’s the type of superhero others will want to emulate and look up to, or if instead he’s nothing more than a vapid needy charlatan undeserving of the gifts that have been so mysteriously bestowed upon him. Shazam! is sort of like some strange, beguilingly euphoric amalgam of Big, Superman, Adventures in Babysitting and Freaky Friday. 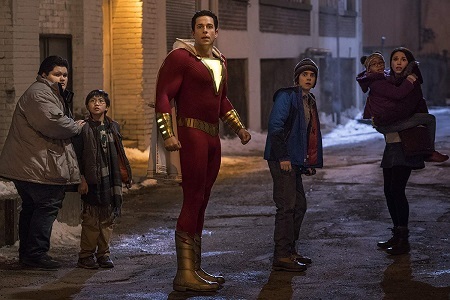 It is a movie built around the growing friendship that blossoms between Billy and Freddie, the two forming a strong brotherly bond as they try to figure out what Shazam’s powers are as well as what the best way for him to utilize them might turn out to be. It is a star-making showcase for young Grazer (last seen stealing scenes as the fast-talking Eddie in 2017’s It) as well as a terrific vehicle for “Chuck” star Levi, the two sporting a rollicking give-and-take chemistry that’s something special. Screenwriter Henry Gayden (Earth to Echo) does a grand job of making this connection between the two feel authentically three-dimensional, Sandberg allowing both actors the freedom to craft these characters even when the inherent necessities of a superhero origin story threaten to derail the film’s momentum and place things on an all-too-familiar track I’ve ridden upon any number of times before. Thankfully this doesn’t happen. As unfamiliar as I am with any of the previous incarnations of the titular character or the comic books first created by Bill Parker and C.C. Beck I don’t know how much Gayden’s script or the original story he concocted with fellow writer Darren Lemke (Goosebumps) differs from the source material. What I do know is that by placing this emphasis on the characters the filmmakers make even the more familiar and cliché aspects of this story more inventive and original than they honestly have any right to be. This is a story of orphan kids making a family of their own design, one they decide on their own how to construct, one that was not forced upon them by DNA, this element giving the picture a hopeful, open-hearted center that’s divine. It should still be noted this isn’t all rainbows and sunshine. Sandberg’s horror background is unnervingly put to good use, and the film’s PG-13 rating should not be dismissed. The main villain looking to take Billy/Shazam’s powers for himself, the nefarious Dr. Thaddeus Sivana (Mark Strong), has nothing less than the Seven Deadly Sins aiding him in his quest. These biblically demonic evils are envisioned as gigantic, grotesque monsters straight out of H.P. Lovecraft, all slimy drooling teeth and slithering tentacles meant to leave their intended victim cowering in fear before they are devoured completely. There is one sequence in particular inside a corporate boardroom that is particularly gruesome, and while I found the scene suitably chilling I can just as clearly imagine younger children wanting to get up and leave the theatre right then and there no matter how silly and agreeably innocent the remainder of the motion picture might prove to be. For my part I didn’t mind any of that. While a little leisurely paced, I still can’t say there was any time watching Shazam! where I felt DC’s latest superhero was failing to deliver the goods. The whole movie builds to a pleasing climax where a hero finds his true calling and a family makes the decision to stand together as one against all the ills of the world no matter what the cost might be. This is a story where the children literally lead the way, teaching all of us to look inside our hearts for the potential hero within whether we think they reside there or not.